“I, Malvolio”, written and performed by Tim Crouch is an adventurous expedition into the continuing tale of one of Shakespeare’s lesser known characters, Malvolio from “Twelfth Night”. Crouch sets out to give Malvolio an opportunity to explain how he has been wronged and give him a chance at his much longed for revenge because, as Crouch says, Malvolio is “dropped by the play.” It is a brave step to decide to carry on one of Shakespeare’s characters beyond the original text but Crouch pulls it off expertly. This is an engaging, amusing, thought provoking piece and I found myself torn between laughing and crying as I watched it. A line that particularly stood out was when Malvolio asks a young boy from the audience up onstage to kick his bottom and, in doing this, find somewhere “between laughter and pain.” This line, for me, captures the feel of the piece perfectly. 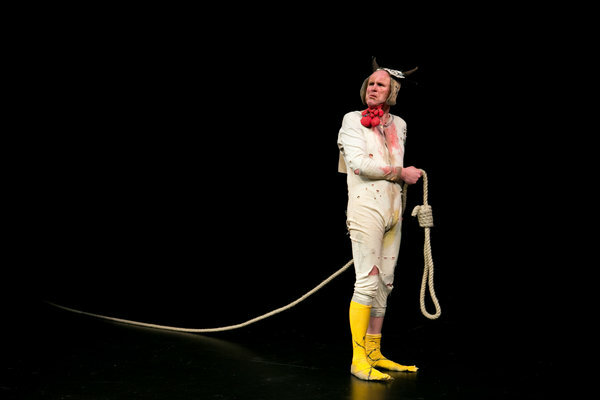 Malvolio is the comic element of “Twlefth Night” but is a rather sad character himself. Like most clowning, this piece is a side-splittingly funny but the humour has formed from sadness. This is a delicate balance of emotion but one that Crouch finds perfectly in his pattering, galloping rants, off the cuff interaction with the audience and terrific use of non-verbal communication in his face and his movements. Crouch makes the audience laugh their socks off but also manages to question why we laugh, the nature of empathy and of course, grant Malvolio his much anticipated revenge in this superb production that deserves every ounce of applause it receives. This entry was posted in Review, Uncategorized.